There is something about Nordic designers that just seem to resonate with The Brvtalist. Perhaps it's their conceptual approach to fashion, minimalist tendencies, use of luxury fabrics or just some sort of je ne sais quoi, but whatever it is, Nordic brands continue to be among our favorites. The Spring/Summer collection by Barbara I Gongini is the perfect example why. The Copenhagen-based designer has caught our attention over the past few years and we featured last Fall's collection here on The Brvtalist. 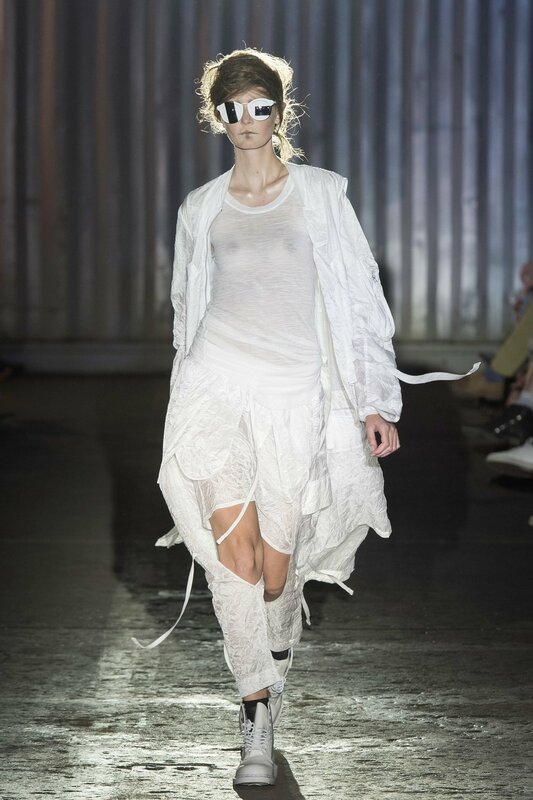 When we saw images of Gongini's runway show a couple of weeks ago at Copenhagen Fashion Week, we were once again blown away. This collection uses blacks, whites, grays and navy to create a cohesive, yet intentionally splintered line which showcases the designer's ability to create works that are both practical and avant-garde. 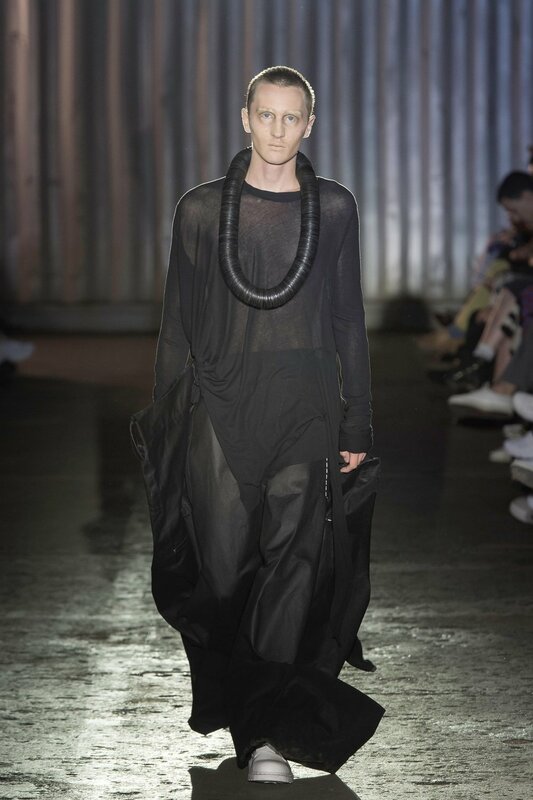 Leathers, flowing, airy fabrics and paratrooper inspired men's pieces carry a militant and macabre energy. The models' hair and makeup no doubt recalls one of Tim Burton's most iconic characters and the deconstructed garments and precisely unfinished seams evoke images of a mad genius in the lab. Accessories also stood out for us including the oversized neck pieces which exude a dark, baroque quality. The men's leather jacket with the extended zippered sleeves already has us salivating for the next season and we are just getting into Fall/Winter. While predominantly solid, the designer does infuse a nice dualcolor pattern which feels almost Art Nouveau but fresh and modern. Overall, this is a striking collection from one of the world's most innovative designers. Very few can take popular techniques like draping, deconstruction and asymmetry and re-contextualize them into something so singular. Barbara I Gongini continues to push fashion boundaries and astonish fans of all aesthetics. For more information and the full collection, please visit the designer's official site.